Top fuel has released their fixed and adjustable pillow ball mounts for the Honda CR-Z, Fit and Swift. The front suspension strut in recent cars use a rubber sandwich method to mount to the car body. Rubber mounts often encounter kinks and have no camber adjustment. 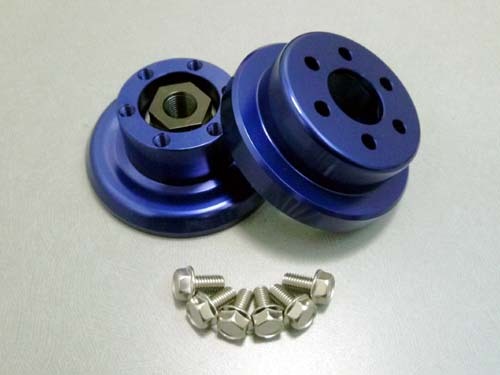 In some conditions such as circuit racing, a large load fixed position damper will move enough to withstand the forces without deformation of the rubber mount that would change alignment. The Top Fuel mount uses aluminum rather than rubber for the mounting part. This removes any of the collapse or deformation that would occur with a rubber mount. The use of a solid piece allows for a more direct handling and movement of underbody and eliminates the bending force applied to the damper shaft. Mount also comes in a camber adjustable model. Because it is designed to be installed and used to stock suspension, it can be installed in almost all of the damper to damper harmonic drive from genuine and pure form. May not be available to use (such as motorized damping adjustment) Some special suspension. • By installing this product, the vehicle height is increased. Camber adjustable ride height is raised about 25mm about 5mm, fixed and camber. Be sure to check the adjustment range of the suspension of your car. · Because you do not want to use the rubber mount, but noise may occur due to the operation of the damper and the shaking of the vehicle. It is not a malfunction.